It started with soccer. Optimization, that is. I was eight and discovered all these neat tricks on how to move the ball quickly from foot to foot. I didn’t know it then, but that was a form of optimization. Years later, I’d use that for my music, my jobs, and eventually, my writing. There’s a thrill to doing something optimally. Optimization is a process, a series of moments that utilize everything you’ve learned up to that point, applying only the most crucial lessons. When I was making music, I’d spend hours and hours reading instruction manuals. I wanted to understand the systemsI used so that I could squeeze every ounce of creativity out of them. You see, when I understood the system—whether it was a piano or a software engine—I was then able to harness my creativity without interruption. That’s a good introduction to who I am, I suppose. I like optimization. So yeah, I used to make music. And perform it, and design it, and optimize it. Spent almost four years on a full-length concept album titled The Orwellian Night. Had it mastered by arguably the best mastering engineer in the world for my genre (same dude that mastered Nine Inch Nails, Judas Priest, etc). If I were to die today, I could proudly say that was my opus. My masterpiece. My “work of art”. I did not “sell out” to the lowest common denominator. I had a good team around me and I made the record I wanted. That was my third record, and by then, the whole touring thing and playing on stage thing and Myspace thing soured on me. Myspace, where I garnered half a million plays, died a 1929 stock market-like death anyway. One of my songs was in a feature film (The Gene Generation) by that point, so I was happy with the level of success my music had achieved. There’s no topping a record like The Orwellian Night anyway. Not now at least. Took everything out of me, that beast did. And the whole stage thing and the industry was too much about ego. It was tiring. So I stopped. Abruptly. Dissolved the band and hung out at home, doing, essentially, nothing. For months. But I hungered to express the essence of being human: creativity. So I started writing again. Feverishly. I mean, I went it at like a man recently freed from prison seeing his first pastry. And the joy came. The simple and beautiful and absolute joy of creating. I wrote the book I wanted to read. The words flowed and flowed, a torrent of what I thought had to be genius. Except it wasn’t. It was terrible. I didn’t know how to edit, how to write, how to frame a story, the works. And that’s when the engines of optimization kicked in. I started studying. I hit the books like a first-year med student. You should see my notes. Talk about minutiae. I read book after book on writing, editing, structure. I studied books on how things were put together. Harry Potter. Wuthering Heights. Anna Karenina. Dragonlance. I was a sponge. Then the grand question came: how to get published? So I began reading about query letters, agents, the works. I was a bug trying to throw itself at a grand system that was old and rigid. I gathered over 200 rejections and lost over a year of my life to that process. What a damn waste. I then began researching self-publishing. Learned from Hugh Howey and David Gaughran and other gentle giants of kboards. Spent two years doing that, just studying and writing, learning from every source I found. As self-publishers, we are each other’s mentors. It’s an open-source movement. So I did some learning, and maybe some partying. Work hard, play hard, right? Anyway, I finished three books in a series, and was working on the fourth, when I realized I just had to do it. I had to publish something. So after months of launch prep, cover design, blurb tweaking, formatting, ISBN and copyright acquisition, blah blah blah, I finally hit that publish button for Arcane. And then something amazing happened. Two-and-a-half weeks in, the book hit three Amazon bestseller fantasy subgenre charts in the US and the UK. It ranked in the 5000’s in the entire kindle store, compromised of over a million titles. And it happened the day before my launch party (this past Saturday actually). Much celebration ensued. None of us could believe it, least of all me. I was readying for a long slog, a five year haul to even approach the top 100 in my genre. Yet here we were, and it was only book one in the series. Thank you for your query, but I’m afraid this is going to be a pass for me. Your opening pages are well-written, but I didn’t get a young adult feel from the language. YA fantasy is a very tight market so I’m only able to take on projects I feel strongly about. I wish you luck in your future publishing efforts. Arcane charted in two children’s books categories and one teen books category. Fourteen-year-old Augum and friends Bridget and Leera dream of becoming warlocks. But with a kingdom in total chaos, it will take courage, sacrifice, and an iron will to make that dream come true.The Lord of the Legion, a vicious tyrant, has overthrown the king in a relentless and murderous quest for seven mythic artifacts--and Augum's mentor, the legendary Anna Atticus Stone, possesses one. While Augum struggles with demons from a painful childhood, a betrayal puts him, his friends, and his mentor through a harrowing ordeal that threatens to destroy them all ... and change the course of history. 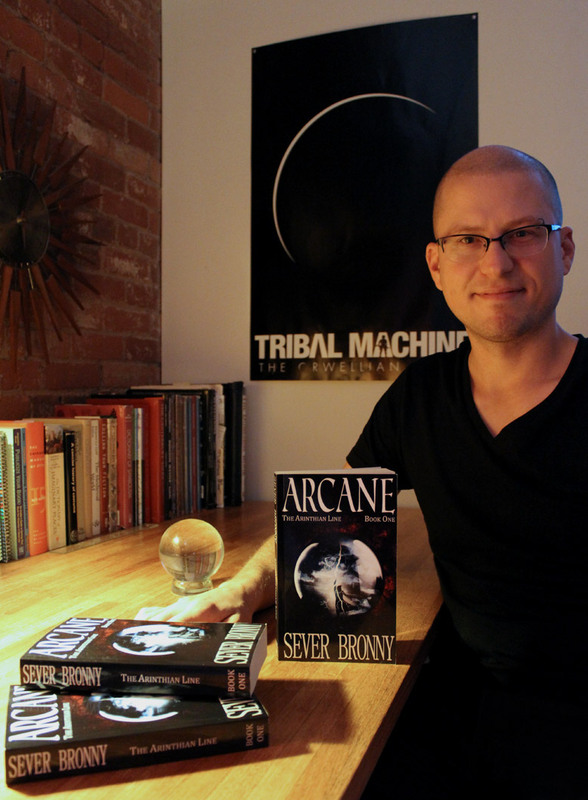 Sever Bronny is a musician and author living in Victoria, British Columbia. He has released three albums with his industrial-rock music project Tribal Machine, including the full-length concept album The Orwellian Night. One of his songs can be heard in the feature-length film The Gene Generation. Arcane is his first book.